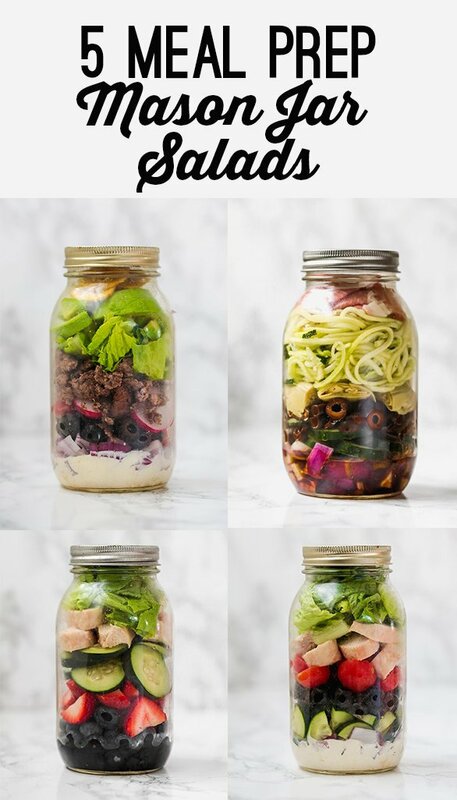 These 5 mason jar salads are an incredibly easy and delicious meal prep idea! It only takes a few minutes to put together a delicious, healthy lunch with veggies, protein, and a delicious dressing. These options are all even paleo, whole30, and AIP compliant. One of the most important steps for living a healthy lifestyle is having a game plan! Make your plan, prepare, and stick to it. Life throws entirely too many things in our way to be able to make healthy choices one hundred percent of the time if we don’t plan. That’s especially true for back to school season, getting a new job, or just a busy period. There are days when we have to stay late at the office, days we get stuck in traffic, and days when we have to run around between meetings, errands, and extracurricular activities. The last thing we want to worry about is what we’re having for lunch! 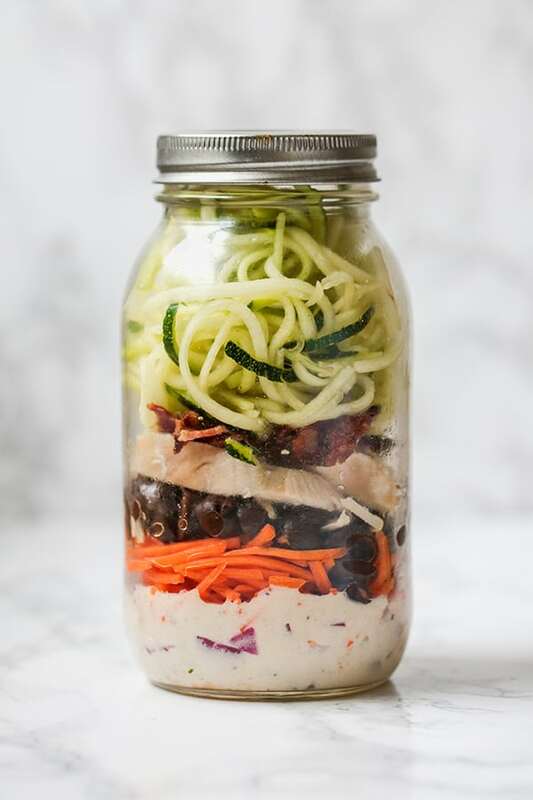 These meal prep mason jar salads are such an easy and convenient meal prep option! They only take a few minutes to throw together and all you have to do is grab the jar, and scoop the salad out into a bowl. That’s it! 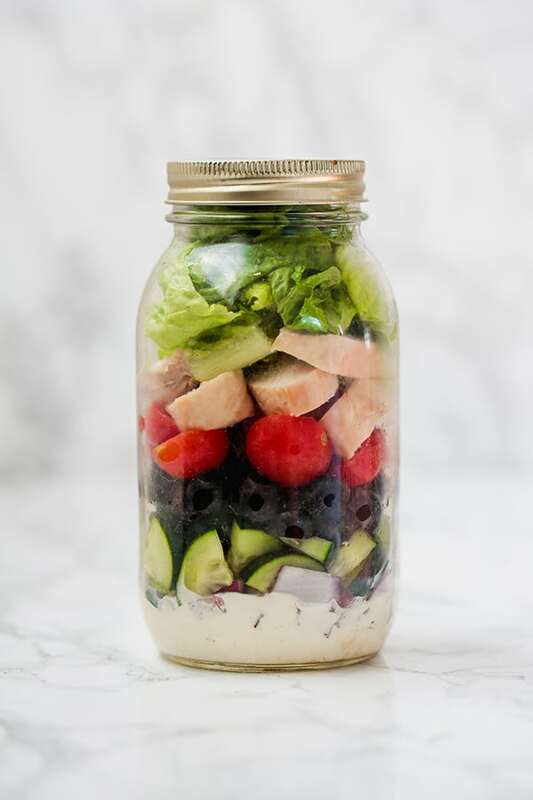 Here, I have 5 mason jar salad ideas that are healthy and easy to make, but this idea is totally customizable. You can use a variety of different salads, dressings, proteins, and ingredients! First, what kind of jar should you use? I’m used to big portions (your girl loves to eat), so I used a 32 oz mason jar. However, you can easily cut that in half with a 16 oz jar, or even double it if you’re going on a picnic and sharing lunch! This Greek chicken salad is made with a dairy-free tzatziki, cucumber, red onion, and other greek flavors! If you’re AIP or nightshade sensitive, just omit the tomatoes. 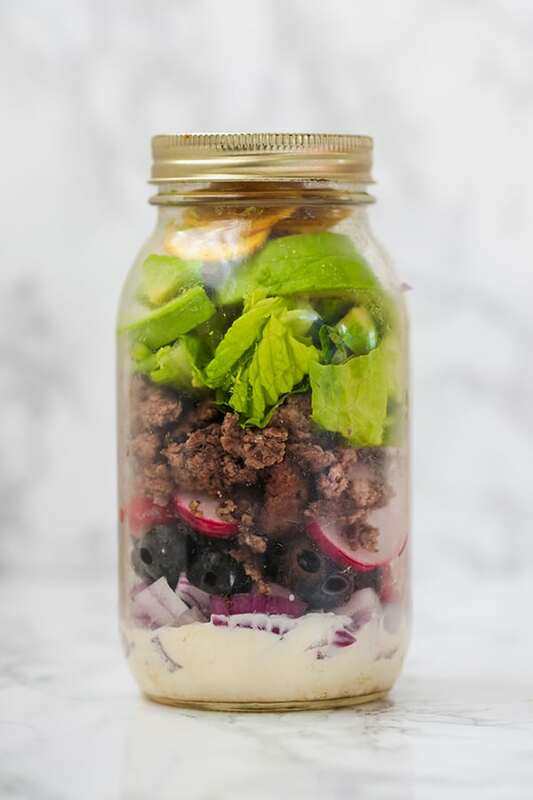 This taco salad dairy-free sour cream dressing and ground beef. You can easily sub chicken or turkey if you’d prefer that to beef! 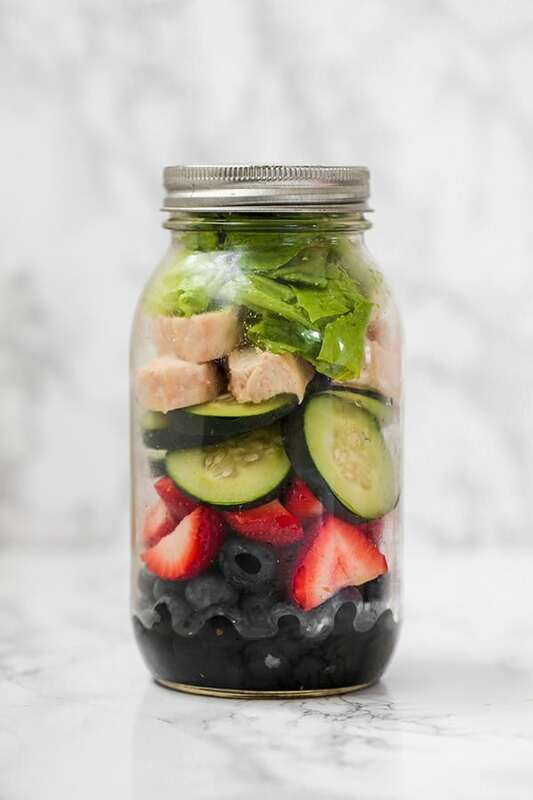 This berry chicken mason jar salad is made with a simple balsamic dressing, berries, cucumber, chicken, and romaine. You can also use arugula, spinach or mixed greens as the salad base. 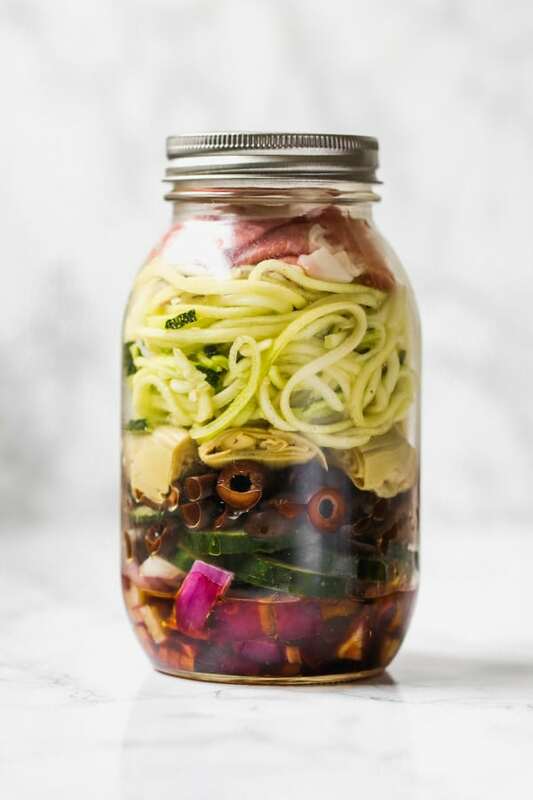 This Italian veggie pasta salad is made with zucchini noodles and proscuitto but you can also use lettuce and chicken! This bacon ranch chicken salad is a variation of this recipe, with added chicken. You can also use spinach instead of zoodles! Start with the dressing at the bottom. Layer in the veggies in the middle. Finish with the protein, and the lettuce or veggie noodles. Store in the fridge and pour in a bowl to eat. Want more salad ideas? Here are some more recipe options! Bottom layer- Dressing. This keeps the dressing from getting the rest of the ingredients soggy. Middle layers- Toppings like fruit, cucumber, and other veggies. Towards the top- Proteins & lettuce. I hope you love these easy and delicious mason jar salads!